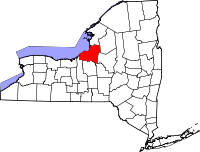 Oswego County, the county seat of Oswego, and the nearby Oswego River all derived their name from an Iroquois word which means "the outpouring." The county is one of the largest counties in the state with regards to land area, and it was officially established in 1816. The County Clerk handles the recording of a variety of items, and operates a research center that is open to the public and contains the majority of materials the office has on file. Among the records at the center are marriage license records dating from 1908 to 1935, naturalization records dating from the 1830s to the 1950s, census records for most decades from 1820 to 1925, cemetery records, family histories and genealogies, and much more. The office also provides a Oswego County History page via its website that provides a number of links and resources for further research, as well as historical information regarding the county itself.